Experience the Kingly comfort and enjoy the royal hospitality by choosing Hotel Mukundgarh Fort as your holiday destination. 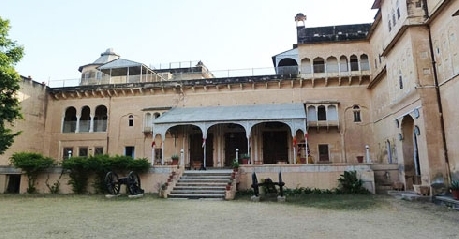 This heritage hotel was originally a 250 years old fort of Mukundgarh that was built by Raja Mukund Singh and stands as a testimony to the imperial past of the Shekhawati culture. The fort been renovated and reorganized by expert architects and decorators in such a way that it retains the old world charm and simplicity. The fort hotel has palatial architecture and opulent décor that is sure to impress patrons at the first sight. As far as accommodation is concerned, the hotel offers Heritage rooms and Heritage Suites options, which are renovated and fitted with modern day comforts to keep guests pampered and satisfied during their stay here. Hotel Mukundgarh Fort also has an in house multi cuisine restaurant that serves authentic and delectable Indian and international delicacies. Being a heritage hotel, Mukundgarh Fort tries to offer guests a glimpse of the golden era of India by offer several amenities and services. These include shopping arcade, swimming pool, Laundry, Doctor on Call, Transport Facilities, travel desk, currency exchange and many more. Hotel also organizes regular cultural evenings with local folk artists and also makes arrangements for Horse Safari and Jeep Safari to explore the nearby areas upon special request from guests. The regal charm and royal hospitality offered by Hotel Mukundgarh Fort is sure to win hearts of guests who choose to stay here. Enjoy the palatial comforts and royal indulgences, while enjoying and experiencing the royal lifestyle of the Indian kings, by choosing to stay at the Heritage Rooms offered by Hotel Mukundgarh Fort. These rooms are part of the original fort complex and sport typical Shekhawati architecture and décor that imparts very opulent and gracious look to the surroundings. The Heritage Rooms are designed by experts in such a way that it retains the old world charm of the imperial era, while offering all the modern amenities and facilities to keep guests pampered. The interiors of the rooms are adorned with stunning balconies, big windows with arches along with charming artifacts and painted walls. In addition to these, the Heritage rooms are also equipped with contemporary comfort facilities such as air conditioning, private attached bathroom, lavish bath amenities, running hot and cold water availability, room service and many others. The regal charm and opulent décor of the Heritage Rooms, allow guests to experience by-gone golden era of India, which is why it has earned rave reviews from guests. If ample space and gracious setting are your requirements for a memorable vacation experience, then the Heritage Suites available at Hotel Mukundgarh, would be ideal for you. These Heritage Suites are part of original fort structure of the hotel and therefore has décor that takes guests back to a much simple time. The décor has very imperial theme and the suite is adorned with stunning balconies, big windows with arches and other architectural elements. The interiors of the Heritage suites are embellished with artistic paintings and sculptures that reflect the rich cultural past and heritage of the Shekhawati region. Moreover, these suites consist of spacious living area, bedroom and lavish bathroom; all of which are furnished with premium materials and fittings. To ensure complete comfort for guests, the suites are also provided with state of the art modern amenities and facilities. The main among them include air conditioning, private attached bathroom, lavish bath amenities, running hot and cold water availability, room service and many others. Ample space and royal aura make Heritage Suites stand out and apart from the other accommodation choices in the region. Hotel Mukundgarh is a popular heritage hotel that gives patrons a glimpse of the regal lifestyle of Indian royalty in by-gone era. And to taking this further at this further, the hotel has developed a royal dining hall and multi cuisine restaurant that serves guests scrumptious and healthy meal, in typical regal traditional manner. The dining hall reflects the overall palatial structure of the hotel and in a way gives a chance to patrons to experience Kingly hospitality that Indian royals enjoyed. The diner serves an assortment of Indian & Regional dishes that are prepared as per age old cooking practices using rare spices and herbs. The unique cooking method brings out distinct flavor of the preparations and has been able to earn rave reviews from the guests. In addition to this, the comfortable seating arrangement and ceremonial setting of the restaurant, makes it an ideal dining venue for both casual and formal events. Attentive staff and timely service has also earned the restaurant compliments from guests.